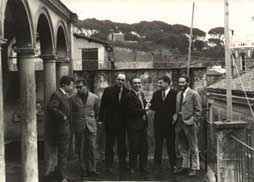 Gruppo di Improvvisazione Nuova Consonanza (also known as The Group or Il Gruppo) was an avant-garde free improvisation group considered the first experimental composers collective. The collective was formed by Italian composer Franco Evangelisti in Rome in 1964. Drawing on jazz, serialism, musique concrete, and other avant-garde techniques developed by contemporary classical music composers such as Luigi Nono and Giacinto Scelsi, the group was dedicated to the development of new music techniques by improvisation, noise-techniques, and anti-musical systems. The group members and frequent guests made use of extended techniques on traditional classical instruments, as well as prepared piano, tape music and electronic music. During the 1970s the music continued to evolve to embrace techniques and genres such as guitar feedback and funk. In addition to concerts, the group issued a series of albums and contributed to many scores by group member Ennio Morricone, including Un Tranquillo Posto Di Campagna (1968) and Gli occhi freddi della paura (1971). The group slowly disbanded after Evangelisti's death in 1980. Can anyone recommend any releases by this group which feature the use of electronics or tape? I feel like I've read in reviews and descriptions of some of their albums about some "wild electronic sounds" but after listening to the majority of their stuff, I've only ever heard acoustic instruments. Did they in fact use any electronics?